Parathyroid glands are formed at the base of the brain while we are only 2 months gestation (7 months before we are born). These glands are formed with the thymus gland and thyroid gland and during our growth inside our mother's womb. The four parathyroid glands are supposed to migrate down the neck to end up next to and around the thyroid gland, giving them the name "para" thyroid glands ("para" means around). The picture on the left shows the potential location of the left parathyroid glands. If the gland does not migrate down it will be found high in the neck under the jaw (the topic of this article, and shown in multiple sestamibi scans below). If the parathyroid gland migrates too far, it will end up in the chest (the subject of a different blog). Any parathyroid gland that is not located next to (para) the thyroid is called an "ectopic parathyroid gland". Ectopic parathyroid glands cause lots of problems for inexperienced surgeons, with more than 75% of patients with an ectopic parathyroid adenoma having a failed first operation. Ectopic undescended parathyroid adenoma. Difficult to see on routine sestamibi scan if you don't know all the tricks! The migration of the parathyroid glands down from the base of the brain into the neck doesn't occur correctly in about 5% of people. Parathyroid glands that don't migrate down and remain high in the neck are called "un-descended" parathyroid glands (they didn't descend-this is the topic of this article). The opposite can occur also, when a parathyroid gland (one of the lower glands) migrates too far and ends up in the chest (discussed in detail in a different blog). Parathyroid glands that migrate too far and end up in the chest are about 15 times more common than parathyroid glands that don't migrate far enough and end up high in the neck. However, please do not worry about this if you come to our center! It drives me crazy when people worry about having a parathyroid tumor in their chest or high in their neck when they are at our center getting ready for surgery. If you have an expert parathyroid surgeon who does at least 50 parathyroid (not thyroid) operations per year (and can prove it to you) then you have nothing to worry about. Parathyroid tumors high in the neck are easily cured (if your surgeon knows it is located there! - keep reading the stories below). Similarly, we can remove about 95% of parathyroid tumors located in the chest through a very small 1 inch neck incision. If you come to our center, you better not be worried about an "ectopic" parathyroid adenoma-you will make us crazy! If you have spent any time on parathyroid.com you will know that we tell people constantly to stop getting sestamibi scans and that sestamibi scans are wrong much more often than they are right. So people ask us "if the scans are wrong so much of the time, why do you get them?". 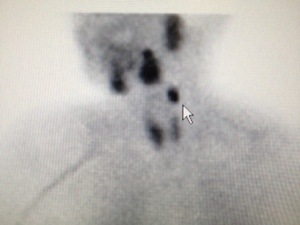 If you understand this article then you will understand: We get sestamibi scans to look for ectopic parathyroid glands! If the sestamibi scan is negative, we are happy as clams, knowing that the patient does NOT have an ectopic parathyroid gland and their parathyroid tumor is "para" (around) the thyroid gland. 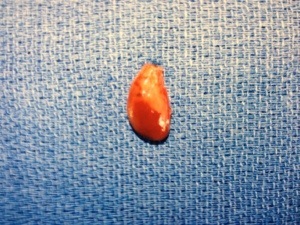 Same ectopic adenoma shown in photo above is easy to see with proper sestamibi scan techniques. Thus, we do the exact same operation on all patients if they have a positive or negative scan-it doesn't matter-the same 12-20 minute operation will look at all four parathyroid glands. The only exception are those patients with an ectopic parathyroid gland-often the location of the ectopic adenoma will dictate that the incision is placed in a different part of the neck preventing us from examining all four parathyroid glands (note, we can still check all four glands in about 90% of ectopic cases-as you will see below). So why do we get a sestamibi scan? The answer is simple: We only care if the scan shows an ectopic parathyroid gland. We want to know if we need to make a special incision. Since virtually all ectopic glands show on a good quality sestamibi scan, that is what we are looking for. In all honesty, we also use the sestamibi scan to evaluate the thyroid too: thyroid size, thyroid nodules, thyroid goiters, and "cold" nodules in the thyroid. But we do NOT care if a sestamibi scan is positive or negative, as long as an ectopic gland is not present. If it is present, we don't care either, except that we may need to change the location of the incision and perform the operation differently. There is nothing special about undescended parathyroid glands found high in the neck. They are not more susceptible to developing into a parathyroid adenoma and causing hyperparathyroidism. In fact, I may have an ectopic parathyroid gland and don't know it. To be honest, I don't care where my parathyroid glands are located as long as they are behaving normally and controlling my calcium in the normal range. The location of your parathyroid glands only matters if you have hyperparathyroidism, and then the only thing that really matters is the location of an expert parathyroid surgeon! Undescended ectopic parathyroid glands require an incision high in the neck. 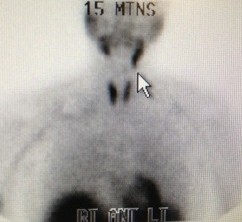 Today we operated on Carole, a 58 year old nurse from Chicago, IL (her sestamibi scans are above). Carole had two previous parathyroid operations in the Chicago area that were unsuccessful at finding her parathyroid adenoma. The first surgeon performed a sestamibi scan and ultrasound scan and didn't find anything, so he operated on her anyway (the correct thing to do!). He operated for just under 4 hours and found three normal parathyroid glands but could not find the left lower gland. The second surgeon at a university performed two more sestamibi scans which did not show anything, so he operated on her for another 6 hours (this was a mistake and should not have been done). He ultimately removed 2 normal glands (another mistake) and she had an injured vocal cord nerve and had to spend 2 days in the ICU. Carole's endocrinologist finally told her to go to Tampa (as did a bunch of other folks!). The two sestamibi scan images above were done at our center about 20 minutes after we met her for the first time, and about 30 minutes before she went to the operating room. As stated above, ectopic parathyroid adenomas show on a good quality scan about 100% of the time, but you have to know what you are looking for, and you have to turn the head a little bit to the side with the camera turned the other way. Importantly, the three sestamibi scans Carole had in Chicago all showed this obvious tumor, but nobody knew what they were looking at and they thought this was just a part of her submandibular salivary gland (the two black spots that are SUPPOSED to be under the jaw on all humans). The third spot is the undescended tumor. 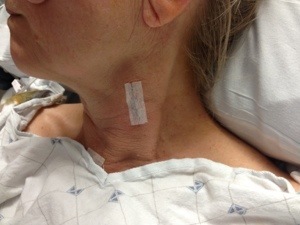 As you can see in the picture of Carole's neck, undescended glands almost always require a different incision, placed higher on the neck and over the carotid artery. Carole's operation took 14 minutes and she went home an hour later cured. She was cured within 3.5 hours of walking through our door, and in that time she met with 2 surgeons, had a sestamibi scan, an ultrasound scan, an operation, and spent time in the recovery room. The picture above-right shows the ultrasound we performed on Carole (we do this in the operating room on most patients). 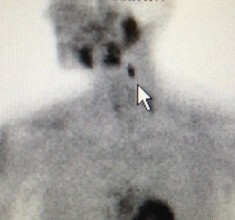 The perfectly round black dot is her carotid artery; the ectopic parathyroid gland is the grey blob marked with a "P". 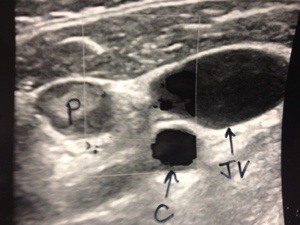 Undescended parathyroid glands are almost always closely associated with the carotid artery and jugular vein. (Note: if you click on most of our photos they will enlarge so you can see them better). Meet Angela, a 65 year old school teacher from San Francisco, California. Angela came to us one week prior to Carole, but their stories were nearly identical. She too had TWO previous parathyroid operations that failed to find her parathyroid adenoma. As you can see from our scan on the left, Angela has a smaller tumor than Carole and so only a very good quality sestamibi scan will show it. Angela had 5 sestamibi SPECT scans, 2 CT scans, 1 MRI and 4 ultrasound scans in the San Francisco area (and two operations). As we have said many times, a good quality sestamibi (NOT a SPECT scan) will show virtually 100% of ectopic glands. Angela's operation took 19 minutes and she left our center 45 minutes later. When I called her that night to check on her (we call all our patients the night of surgery), she was at the Hard Rock Casino playing the slots! We cured her in less than half the time than ANY of her scans in California took to complete. The money wasted on scans and unsuccessful operations is amazing. Folks, you should see what we see-your eyes would pop out of your head! Meet Robert, a 71 year old gentleman from Boston who doesn't have the energy to do anything! Robert was sent to us by his primary care doctor who got fed up with the endocrinologist who was "doing nothing because he couldn't find the tumor with his ultrasound machine!". This is another problem with scans (which we keep telling you are wrong 100% of the time when negative, and are wrong about 60% of the time when positive!). Since parathyroid glands are supposed to be around the thyroid, when people perform an ultrasound looking for a parathyroid tumor they NEVER look in the weird (ectopic) places. They are simply too hard to find on ultrasound UNLESS you know that they are ectopic-and the sestamibi scan will tell you that. When Robert was sent to us he had 21 high calcium levels (between 10.5 and 11.9 mg/dl) and 16 high PTH levels (all about 180-210 pg/ml). He has bad osteoporosis, no energy, atrial fibrillation, 3 bouts of kidney stones, and now some kidney failure (read our blog on the duration of high calcium). He is literally dying of hyperparathyroidism but his endocrinologist ("an expert at a major Boston university" ???? ) never sent him to a surgeon because he can't find the parathyroid tumor on ultrasound. According to Robert, the endocrinologist says "I can find all parathyroid adenomas, so I just don't know what to do". My answer is this: Stop scanning this man and get the damn tumor out of his neck! Robert had 2 sestamibi scans and 7 ultrasound scans over 5.5 years and was allowed to suffer for no reason. UGH! Robert's PCP sent him to us and we booked him for surgery. We don't give a hoot if his scan is negative or positive-a positive scan won't save us 10 seconds in the operating room! 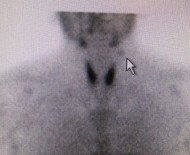 Robert's sestamibi scan performed at our center on the day of his surgery is shown above, clearly showing a very large ectopic parathyroid adenoma in the upper left part of his neck. If the pictures are taken with the camera straight on, the adenoma overlaps the submandibular salivary glands (the two large blobs under everybody's jaw) and you miss this tumor. 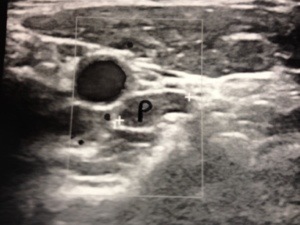 Once you realize that his parathyroid tumor is not "para" (around) his thyroid, and is instead located under his jaw, then it is very easy to see it on the ultrasound. The picture to the right is the ultrasound I performed on him. This operation took 8 minutes (we did not look at the rest of his parathyroid glands because we had to make an incision high in his neck under the jaw). He went home 45 minutes later. The absurdity of a man dying of a tumor that takes 8 minutes to cure is beyond comprehension. Look folks, this is why you want an expert in parathyroid disease and hyperparathyroidism. We know everybody with a parathyroid tumor can't come to Tampa, Florida… but please educate yourself and don't let your doctor do dumb things because they can't find the tumor on a scan. Remember, if the scan is negative it is wrong 100% of the time, and if it is positive it is wrong about 60% of the time. Stop getting scans folks. And stop going to endocrinologists who do dumb things. Most endocrinologists are not very good at parathyroid disease. If you could only see the nonsense we see every single day… your other eye would pop out of your head! Be smart! Nobody is taking care of you but you!